The painting 'Three Studies For a Portrait of Lucan Freud' sold for £23m. The painting ‘Three Studies For a Portrait of Lucian Freud’ by Irish-born artist Francis Bacon was sold on Thursday night for £23m. The painting was sold at auction at Sotheby’s in London for more than three times its pre-sale low estimate. The unusual piece was painted by Mr Bacon in 1964 and shows a close friend, and fellow artist, with a variety of facial expressions. It was estimated the painting, which was sold by a private collector, would sell for between £7m-£9m. The painting was bought by an anonymous buyer in the packed saleroom after seven minutes of intense bidding by more than ten people, from four different continents. Bacon was born in Dublin in 1909 but grew up in Co Kildare. He left Ireland and spent most of his adult life in London. He died while holidaying in Madrid, in 1992. His studio was donated to the Hugh Lane Gallery in Dublin where it was reassembled and is on permanent display to the public. Bacon’s painting was one of 60 works in last night’s sale of a private collection of modern and contemporary art. Sotheby’s said all 60 works were sold raising a total of £93.5m. 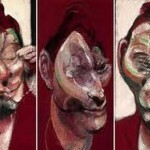 The highest price ever paid for a painting by Francis Bacon was achieved in 2008 when Sotheby’s New York sold his Triptych, 1976for $86.3m to Russian billionaire and owner of Chelsea Football Club, Roman Abramovich. Cheyenne Westphal, chairwoman of Contemporary Art Europe at Sotheby’s, said of Mr Bacon’s portrait piece: “This striking painting has everything a collector in the current market is looking for. “It is an artwork that radiates ‘wall-power’ with its brilliant colour and dramatic brushstrokes. “It narrates one of the most impressive artistic relationships of the 20th Century between two titans of British art and is desirably fresh to the market having remained in the same collection for almost half a century” she added. VARIED INFLUENCES: Some of the heads on show at ‘Portrait of an Artist’. An array of colourful, playful and thoughtful heads form this delightful collection. In the past Mohit Jain has had exhibitions based on the vanishing traditions of kites, masks and miniatures at his gallery, the only difference being that this time the exhibition boasts a head done by even the gallery owner. One is surrounded by heads, their doe-shaped eyes looking intensely. Who is the viewer, you or them, one can’t tell. Almost 90 per cent of them share the facial features but yet each one stands on a different platform of thought and perspective. These 60 heads done by a melange of young, upcoming and senior artists — painters, sculptors and designers — form the latest exhibition “Portrait of an Artist” mounted by Mohit Jain at Dhoomimal Art Centre, an art gallery located right in the heart of the city. It isn’t the first time Dhoomimal is handling a theme-based show. In the past Mohit has had exhibitions based on the vanishing traditions of kites, masks and miniatures at his gallery, the only difference being that this time the exhibition boasts a head done by even the gallery owner. Now, what could have been a very limited canvas for an artist — Dhoomimal offered them fibre glass heads in three different sizes to work on — has turned out to be just the opposite. The sculpture in places seems to have been a toy in the hands of the artist, who really enjoyed playing with it, like in Satyadheer Singh’s work ‘Van Devta’ — a head placed on a bullock cart — or Sudhanshu Sutar’s head of Mahatma Gandhi kept in a box which bears vivid imagery of freedom fighters, illustrious leaders, top businessmen, etc. Satyadheer or Sudhanshu aren’t the only ones who have taken the liberty of adding something to the head. Senior artist Shail Choyal, in whose paintings one can easily trace the impact of traditional miniature schools of Rajasthan, has come up with a stunning work done in ceramic and acrylic. Tiny ceramic eyes are pasted upon the head covering the entire area, and the artist has added two hands. The hands and the facial expression appear to be asking a question. Young artist Anup Akhar Pandey has added hair to his piece painted in white adorned with hair accessories and comb. Another artist, a product of the reputed National Institute of Design, Ahmedabad, too doesn’t restrict himself to the given space. 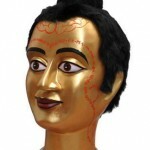 He places the head on a wooden base the top of which bears sanjhi craft work of Vrindavan. On the wooden base which is reminiscent of the wooden utensils of the North-east are perched a few chirping wooden birds. Two of them sit atop the head. The birds are also crafted in the folk style of Bastar. Faiyyaz Khan’s piece reverberates in the mind in this context. The Bhopal-based upcoming artist has painted his head bright warm yellow portraying the world of today and employs a few elements of the past to do so. Khan simply describes his work as an effort to reflect what goes on inside a mind. “Every feature is highlighted by a form painted upon it. While the nose is highlighted through the birds flying happily, on one ear I have painted an earphone, whereas the other one has bells of the temple on it,” says Khan. Further, the lotuses signify the serene eyes; the golden beads covering just a small portion of the head refer to a human being’s intention of achieving enlightenment and knowledge. Every form does its bit to make the work effective but what work most are the two buckets reminiscent of a fire brigade service used as earrings. An interesting aspect of the show is the inclusion of a number of young and upcoming artists below the age of 30 and artists who are essentially and only painters barring a few like N.S. Rana, etc. You are currently browsing the Indian Art Blogs blog archives for February, 2011.